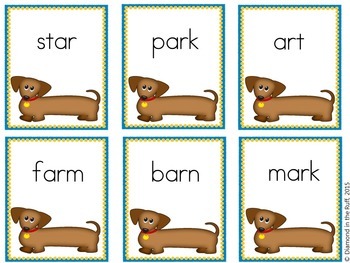 This is a fun game that students can play in order to reinforce reading -ar words. Directions are included on how to make the game. Place cards in a small basket. One player at a time chooses one card from the basket. The player reads the word on the card. If the player reads the word correctly, he/she keeps the card. 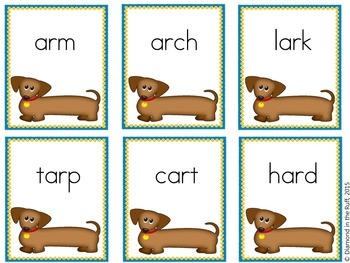 If the word is read incorrectly, the card is placed at the bottom of the basket. The game can be played until you decide it is time to stop. 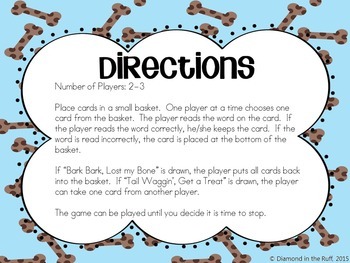 If “Bark Bark, Lost my Bone” is drawn, the player puts all cards back into the basket. 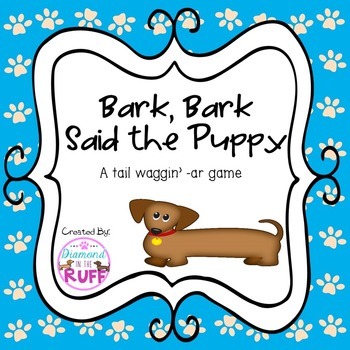 If “Tail Waggin’, Get a Treat” is drawn, the player can take one card from another player. When you provide feedback on TpT, you will earn one credit for every dollar spent. You can use the credits earned towards future TpT purchases to help you save money! Providing feedback is important because it helps you save money and it helps me to make products that will be best suited for your needs! Be sure to follow my TpT store by clicking the green star under my name or click on the “Follow Me” button. Following me allows you to receive notifications of new products and you will receive email updates about my store.